Most students don’t expect to see other students flying on broomsticks and chasing a tiny winged golden ball as they stroll through campus. That, however, would be the thinking of a Muggle. Real-life quidditch — the kind played by QC Pitt and dozens of other teams throughout the world — is a sport derived from the award-winning “Harry Potter” book series written by J.K. Rowling. In the books, young witches and wizards compete on school quidditch teams, flying through the air on brooms and scoring points for their teams by catching, throwing and avoiding various types of balls. QC Pitt attempts to imitate the game, practicing on Friday nights and Sunday mornings on the Cathedral Lawn or in the Cost Sports Center, in preparation for the fall and spring seasons. According to senior captain and mechanical engineering major Emma Stilwell, the fall and spring seasons have different dynamics. “The fall is usually really intense and then spring is more just to have fun,” Stilwell said. This is because QC Pitt seeks to qualify for the Quidditch World Cup during the fall — something it hasn’t achieved since 2013, when it was eliminated in the group stage. The two-day weekend regional tournament against the rest of the Mid-Atlantic Conference occurs every year at the end of the fall season, pitting QC Pitt against rivals like Penn State. Although the fall season determines whether QC Pitt will achieve a Quidditch World Cup berth, the high stakes don’t take the fun out of the game. The game of real-life quidditch tries to mimic its fictional counterpart as closely as possible. There are some catches — a fictional sport where players fly on broomsticks and a tiny golden ball zooms around like a sentient object cannot be replicated to perfection. In both versions of the game, there are seven players on the field per team — three chasers, two beaters, a keeper and a seeker. In the novel version, chasers attempt to score points in hoops with balls called quaffles while beaters attempt to keep flying bludgers from hitting other players. The seekers are given the ultimate task of searching for the Golden Snitch — a tiny, winged golden ball that floats around the quidditch pitch of its own accord. Catching the Snitch usually wins the game, since it’s worth 150 points. In real life, a volleyball serves as the quaffle, and the chasers still attempt to score on three hoops, which stand about six feet in the air. The keeper plays the same role, and beaters throw dodgeballs at opposing players in an attempt to get them off their game. In “Harry Potter,” quidditch is an aggressive and often violent sport — and the quidditch played in the real world adopts this violent nature by including legal tackling. Ashley Cipcic, a junior chemistry major, noted that it’s sometimes been difficult to get players that would be a good fit for this type of sport. Most participants, like QC Pitt, play with PVC pipes between their legs rather than broomsticks, though teams with enough funding do use brooms. The Snitch is a neutral human with a tennis ball or yellow flag hanging from their waist. The Snitch enters the game 17 minutes in, and is worth 30 points — a mere fifth of the value of the Snitches Harry Potter himself captured. Cipcic has an exceptional love for quidditch, especially her position of chaser. She is particularly fond of the chasers’ team within a team, of sorts. Although the quidditch team has always had enough players to form a team, numbers have been on a slight decline. This poses an interesting challenge, one that Stilwell seems ready to tackle this year. 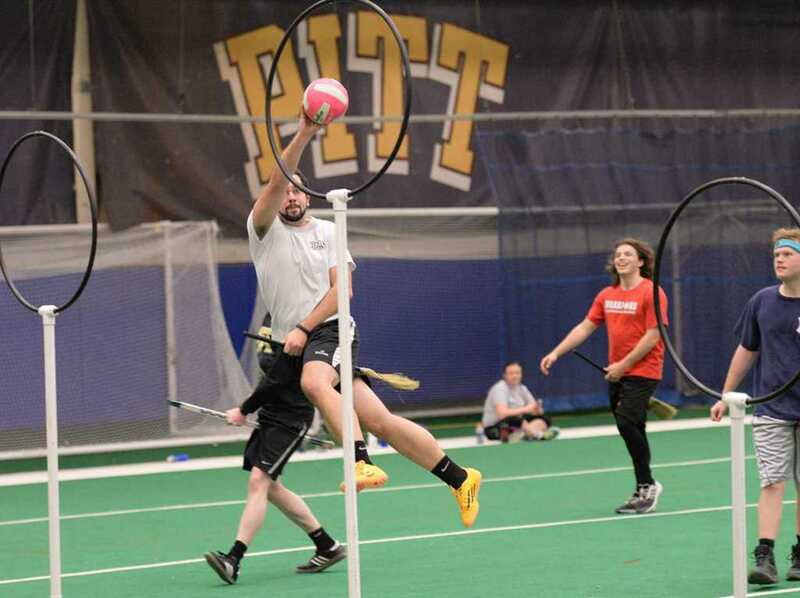 In contrast to the current situation at QC Pitt, quidditch’s popularity as a sport has continued to grow competitively and strategically since its start over a decade ago. Chandler Larkin, a 2017 Pitt graduate and former chaser and captain, saw this firsthand as someone who started playing quidditch a few years after it was made into a real sport. As a senior and captain approaching her last year at QC Pitt, Stilwell had nothing but excitement when describing the sport that has made her college years special.